3 Bedroom Semi Detached House For Sale in Sheffield for £120,000. 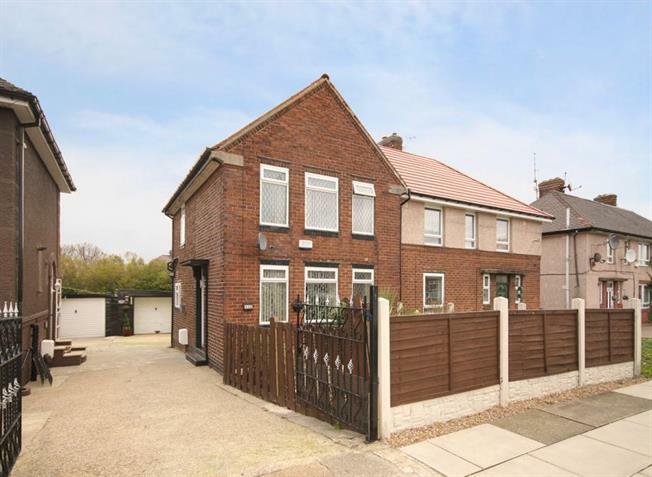 An internal inspection is highly recommended to appreciate the standard of accommodation on offer in this beautifully presented three bedroomed semi detached home , upgraded by the current owners inside and out, located in the heart of this popular and highly convenient suburb. Offering accommodation over two levels with the benefit of double glazing, GCH, garage and lovely gardens. Ideally located for the full range of excellent amenities including local shops and supermarkets with retail park at Wadsley Bridge, local schooling, public transport links with access to the city and principal hospitals, walks in nearby Grenoside woods and road network to the motorways. The accommodation comprises an entrance hallway with stairs to first floor landing. The lounge has wood effect flooring, decorative fireplace focal point and a pair of windows to the front. The Dining Kitchen is fitted with an superb range of base and wall units in shaker style finished in high gloss white with contrasting granite effect work surfacing, inset sink, coming complete with integrated oven, hob and extractor, plumbing for washing machine and tiled splash backs, with useful under stairs cupboard, windows to rear and side and rear access door. On the first floor the Master Bedroom has wood effect flooring, built in wardrobe for storage and window to the front. Double bedroom two has wood effect flooring and window to the rear and Bedroom Three provides flexible accommodation as third bedroom, nursery or study. The bathroom has three piece suite comprising WC, wash basin and bath with shower over, tiled splash backs and rear window.